This blend of sundried beans and spring-water washed beans result in an extremely sweet, mellow tasting flavour, with citrus aromatics. 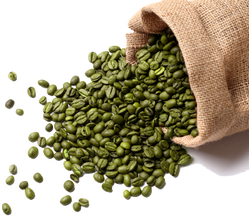 The coffee our Baristas use in our cafes. SKU: 1231. Category: Don Adan Blend. This blend of sundried beans and spring-water washed beans result in an extremely sweet, mellow tasting flavour, with citrus aromatics. The subtle balance of flavour and aroma, medium body and a well-balanced acidity has made Don Adán blend an award winner in both the national and international arenas. It possesses a smooth after taste that will ring like a bell in your mouth. 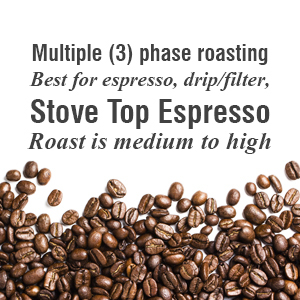 The roasting of this blend is done in three different phases, allowing the extraction of the different qualities required to make a balanced cup. 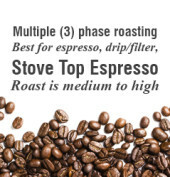 We recommend using this coffee for espresso, stovetop espresso, drip or filter. The roasting method varies from medium to medium dark in colour.